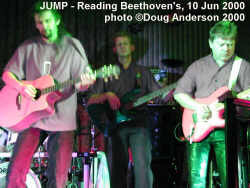 Here we are again, back in Reading Beethoven’s for the first Jump gig in almost 3 months. The usual nominal fee of £2 is paid on the door as we enter to find a busier than usual bar area. I'd forgotten just how much I enjoyed seeing this band and it was nice to experience the show again. If you've not seen Jump 'in the flesh' then you really must get along to a gig as the music comes over so well live. I think what makes the shows so enjoyable, apart from the musical ability of the band, is the wonderful stage presence and usually witty banter of John Dexter Jones. It's little wonder that he was voted Best Male Vocalist by the Rotherham-based Classic Rock Society late last year as he really does stand head and shoulders (physically as well as metaphorically) above many other frontmen. He certainly has the 'gift of the gab', and he's only a Welshman! 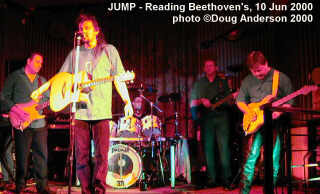 ;-) All I knew about Jump before I first saw them perform was that they were very Fish/ Marillion inspired. I guess, to an extent, that comment is true - but only in respect to one side of the frontman. John certainly has the same sort of approach to an audience and story, as well as a need to comment on and link current world matters into song introductions as does Fish. He goes further than Fish though, actually changing whole lines of tracks to tie in with his introductions. After 10 years of this he really is a master of the art. I've seen plenty of frontmen in my time and John ranks well up the list, probably top of the list of entertaining storytellers. Gillan, Fish or Ian Anderson would have probably been the other contenders but they've all fallen by the wayside in recent years. Gillan (my all-time fave vocalist) has regressed from consummate entertainer and storyteller to one line rehasher (all be it in slightly different context) on recent tours, Ian Anderson seems to have discovered swearing - the last show I saw every track introduction seemed to have at least one or two swear words included, and Fish has recently hung up his touring flippers and just doesn't do it any more! Just after 21:15 the sextet that is the Jump music machine wandered through the crowd to only minimal applause. John Dexter Jones (JDJ from now on) wasn't happy at this low level of excitement from the usual crowd, tonight bolstered by some locals, and told us that he wanted a "lot more than that from us!" I should perhaps point out, for those of you who have never experienced Jump in action, that JDJ's sense of humour knows no bounds. He will have a go at anyone he thinks is a fair target - the band suffering as much as the audience. He had a go at the smoke machine operator, in no uncertain terms, the first time I saw Jump. There have been one or two times that I feel he's stepped over the line but thankfully these occasions have been few and far between. 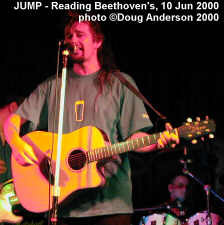 This is the first Jump gig of the year and, indeed, Millennium (in computer users eyes at any rate) and dead handy now that Tracy had recently moved to Reading. The Millennium must have been wiped from the mind of JDJ after the Welsh defeat at Rugby this afternoon as the expected comments (after those he made in the couple of the pre-Christmas shows we saw) failed to materialise. There were other matters, more pressing than a mere New Millennium or loss at football, on tonight’s agenda however, the release of their latest CD, Matthew. The disc was not due for general release for a month or two in the shops but fans tonight would be (the first people) able to purchase it. John recited a few lines of Dylan's ALL ALONG THE WATCHTOWER before the band launching into the first track of the evening (starting as they meant to go on with one off the new CD) PARADISE MISLAID. To regular Jump gig-goers this pulsating track may not have been a completely new, they'd played it several times before at previous shows, though possibly not at Beethoven's. Time only for the title to be spoken by JDJ before the music moved directly into IT'S YOUR LIFE, again from the new CD. A brief dedication preceded the following song, "to all the people bereft in Chechnya, this is MOSCOW CIRCUS". There is a distinct rollercoaster feel to the beat on this number - a very pleasant track to bop along to. During this track JDJ began the first of many references to current affairs, General Pinochet and Chile being the target in this case. He even went as far as changing whole lines of lyrics to these references." and somewhere in Chile, a remarkable recovery" This is one of those things that make coming along to a Jump gig so enjoyable, you never get the same show twice! The overt politics of Moscow over, a simple nod of the head from JDJ to Pete brought forth the riff for EVERYBODY STOP, the first truly new track of the evening. Again it features a similar, almost reggae, beat to the previous track. 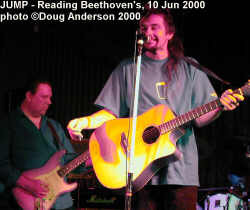 It is also from 'Matthew' but this was the first gig that the band played it live. "Thank you. I spent today walking around Aylesbury." "Crying!" came the call from the crowd in reference to JDJs team having lost miserably at football earlier in the day. Slightly miffed (the heckling touching on a sore point) John dodged the heckle by mocking the bandit player in the corner before continuing "We're talking football tonight…" (more current affairs). Eventually he made it to introducing another new song, dedicating it to the Northern Ireland secretary, "Peter Mandelson and Nigel Campbell, the people who make our lives worth living by telling us what we should be thinking, DR SPIN." Unfortunately Pete is not quite ready for this straight-ahead rocker so there is a slight delay whilst he “plays with his new toy" (a guitar pedal?) and gets it ready. "This is a song called MATTHEW." Over the slide guitar (Pete) and military drumbeat (Andy Barker) of the albums title track he added "In all the pizza joints in all the world, he had to walk into mine" for some unexplained reason. Again, this track has been played at many of the shows last year though the old introduction had been dropped (as Matthew may have been in the audience.) The song is mellow through the verses though it has a warm bass backing care of Mr Faulkner. Some of the lyrics were changed to "Led Zeppelin, but then again Jimmy's got a few fans of his own" in place of the usual REM lyrics. Deep purple got a look in too with mention of "Speed King, Black Night and "hey, Peter and Ritchie, what a great team". "We went through a whole period of time when we worried if Matthew might come to a gig so we changed the title to Terry!" Terry (the lighting man) then took a lot of stick about his hair, and actually having some, as well as being on the cover of a Jump newsletter before the insults moved on to being cheeky about Steve beginning to lose his. What was the point of this? Merely to embarrass people? No, the song introduction continued, "This is a song from the Myth of Independence, produced and played on by a certain bald person. This was played on by Mr Mark Kelly... VALEDICTION." The next link told how JDJ and Andy had "driven around,arriving late to avoid setting up gear." The plan was flawed however as the others managed to break his monitor amp. That'll teach them to try it on. They came via Nettlebed as featured in the lyrics... of The PRESSED MAN (from Living in a Promised Land'). After JDJ told us "my little lad loves Mambo Number 5 … I wish we could play it but, as Matt would have it we're too much of an old man band for that." As JDJ waffled Steve is tuning his guitar, Jonesy eventually saying "work through the chords Steve, but don't give them all away!" LOVE SONG NUMBER 5 was written "for my family" and is, as the title says, a slow love song that features a mellow solo from Steve. A joking addendum: "We've sold that song to Eric Clapton and it'll be on his next album!" "This is on the new album, we haven't talked enough about the new album … we haven't set into the big pitch yet." That would come later but first a little about the next track. "This is a song about my grandmother and Jo's grandmother who between them had 153 sisters. That doesn't scan in the song so we reduced it down to the nine most important ones. It's called NINE SISTERS and we've never played as a band before." 5 of them had, but not all six. After donning an acoustic guitar being passed a pick John began a basic blues riff explaining "I always wanted to be in a blues cover band because you earn a $@&k sight money than we do" in a dig at the lack of money offered by the venue (?). To prove the point of how easy making a blues tune up on the spot was he ad-libbed a bit of blues with MONEY FOR OLD ROPE BLUES. "Ah, but that's too easy" as he slipped into some REM lyrical excerpts before progressing onto one of their own tunes, "a song from the first album." I think this was the only Millennial reference the whole evening, "That was a long time ago, it was last century." WHEN THE LIGHTNING COMES is a "'tribute to the roadie' song which I'll do in a classical style tonight." He sang the first few lines in a cross between what I assume is his version of a 'classical' vocal and a Vic Reeves pub singer style. Eventually it moved into the song proper after the aforementioned roadies had cleared the various intertwined guitar leads onstage. After a brief flirt with some REM lyrics ("losing my religion") they moved into another tribute song, SWEET HOME ALABAMA/SANTIAGO. As you may have gathered there are more Chile and Pinochet references in this b@stardised version of the Lynyrd Skynyrd track - the second half being the retitled version. The audience joined in with the chorus before Steve takes led duties for the solo. The piece almost returned smoothly into the initial song but soon was waylaid by a chorus of YOU CAN'T ALWAYS GET WHAT YOU WANT and almost The ACE OF SPADES before finally returning to WHEN THE LIGHTNING COMES. The whole band look impressed that everything was going well during finale of Lightning. "If this guitar is still in tune its a miracle." SHED NO TEARS is introduced as a track which is "a song off the 'All the Kings Men' album which will be released again this year - with a different cover. No extra tracks though, they'll come out on the compilation album … by "John DEXPLOITATION Jones!" A touch of keyboards and drum beat moved things into a hint of Led Zeppelin, ROCK AND ROLL, then BABY PLEASE DON'T GO (by Them ?) while the guitars took John towards Paul Rogers and ALL RIGHT NOW. Jonesy lost the lyrical thread during it but thankfully the crowd were in good voice and pulled him through to the chorus. He then moved into a marginally less vague version of FEEL LIKE MAKIN' LOVE before asking for "one more" so Pete returned to Zep for a rather stuttering HEARTBREAKER. As Steve teased John and the audience with a snippet of STAIRWAY TO HEAVEN John pushed a point with "the reason we're doing this is that we hope to get paid more." They "used to do 30 minutes of Zep covers when we only had 30 minutes of our own material." All this eventually led into "the first song wot we wrote", "a song about television", THE LIGHTBOX. "This is a sexual song for Matthew, it's called TONGUE TIED" followed before the 'hard sell' bagan. First, to get Andy F worried, "Hugh Gasgoyne on the bass guitar - old ghosts gone " then "2- 2 with Cardiff. The Wycombe Wanderer on the drums, Andy Barker, the baron." Guitarists next, "on the blue guitar, a man voted by Brave Hearts (a fanzine ?) as the next biggest guitar player to Steve Rothery (take that as you will - size or skill) guitar Steve." A proper intro for the four stringer next, "standing in for..." "no, that all over now, Mr Andy Faulkner occupying the bass guitar." JDJ introduced himself with subtle (not) hint to roadies to get him a Coors "From myself John Dexter Jones it's approaching 11 o'clock so get your last drinks in and, while you're there, get me one." The last time the guys played Beethoven’s one local left demanding his money back is how JDJ began his convoluted introduction to the return of Mo on keyboards. He stated "we can do without Pete but can’t do without Mo. A warm welcome back to the live format for the lady from Glasgow, Moon keyboards." No slipping off then back on stage here, just a quick advert for karaoke on Thurs etc (to much silent mugging and miming from JDJ -head on 'pillowed' hands to symbolise sleeping etc.). "This is a song that was written in the Racket Club. A song that features the talent of Mr la la la America Peter Davies. (Pete had missed the previous Beethovens show as he was in America on business) It's called KEEP THE BLUES." A cheer form the audience for "I come from the land of mountains" line - a fellow Welshman possibly - while another cry for the following line "I come from the land of rain" come from someone a bit less fussy obviously. John then asked us to "remember when we were young" as a link into a brief section of SHINE ON YOU CRAZY DIAMOND Part way through the track John spotted someone playing the fruit machine and advised him on what to hold and what to change: "now there's a compulsive look in your eye - should have hear a cherry instead" to a punter on the bandit." A man of many (nefarious) talents. "Thank you very much. I won't fight my way through the throng. this is song from All the Kings men but its not All the Kings Men. This is where you all get to exercise your own vocal chords." and is dedicated to "everybody in Swansea", 2UP 2 DOWN." Drinking time is almost up but "we're going to squeeze another one in because we love Beethovens so much." 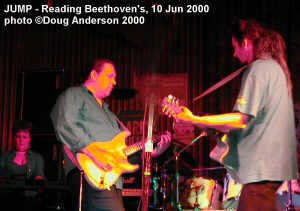 ROLL OVER BEETHOVEN was sung over intro riff to FREEBIRD which, after a verse, merges into KNOCKIN' ON HEAVENS DOOR. "You've got to buy the album now" but not quite yet as there's one more chorus of Knockin' to go. A brief "Thank you. Good night." ends the set and. 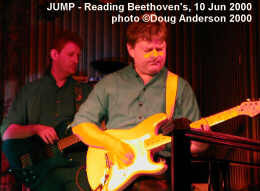 though the crowd calls for more, that was it - another fun 2 hour show from Jump. All that's left now is the hard sell of the new CD. "How much am I bid for this CD" asks Jones as he held up the first copy of the latest release, It was soon snapped up as were several dozen other copies before we were all ushered out of the venue. MATTHEW, features the following tracks, most of which were played tonight. This page was first created on 9 March 2001. Last updated 9 March 2001.